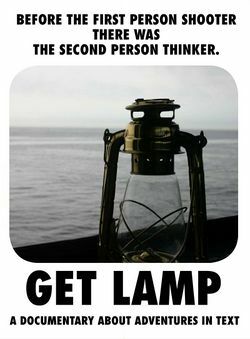 Get Lamp: The Text Adventure Documentary (http://www.getlamp.com/) is an documentary film project by Jason Scott, Filmed between 2006-2008 and released in 2010. Filming started in February of 2006 with an interview of Mike Berlyn, with pre-production research taking place at least a year before that. August 2010: GET LAMP Ships. GET LAMP consists of two DVDs. The first a collection of three main features as well as a slide-show-based text introduction by adventure game columnist Scorpia. "GET LAMP" is a general documentary on the story of text adventures, covering a number of subjects ranging from the genre's roots in caving and home computer available, up through to the "modern" era of interactive fiction creation and groups. "Bedquilt" is a study and tour of the cave system (Bedquilt, part of Mammoth Cave) that the original game "Adventure" is based on. "Infocom" is a roughly 50 minute documentary on the game company Infocom told from the point of view of players and employees of the company. The second disc contains a music video by MC Frontalot, entitled "It is Pitch Dark", as well as a "Bonus Features" section with 30 short films, ranging from 20 minutes to less than 1 minute, covering additional subjects. This second disc also contains a DVD-ROM section with games, photos, videos and audio related to the production, or provided by current interactive fiction authors. Get Lamp now available, Boing Boing, July 28, 2010.